Mac Deaver, middle son of Roy and Wilma Deaver, was born in Abilene, Texas on December 6, 1946. At the time of his birth, his father was preaching for the church in Haskell, Texas. However, after spending some time in Haskell and Vernon, most of Mac’s boyhood days were spent in the Fort Worth area. He graduated from Fort Worth Christian Academy in 1965. He received the A.A. degree in Bible from Fort Worth Christian College, graduated from the Brown Trail Preacher Training School, received the B.A. degree in Bible from Oklahoma Christian College, received the M.A. degree in Philosophy of Religion and Christian Doctrine from Harding Graduate School of Religion, did graduate work at the University of Dallas, and received the Ph.D. degree in Christian Apologetics from Tennessee Bible College. Mac has preached and taught the gospel of Christ for nearly fifty years. 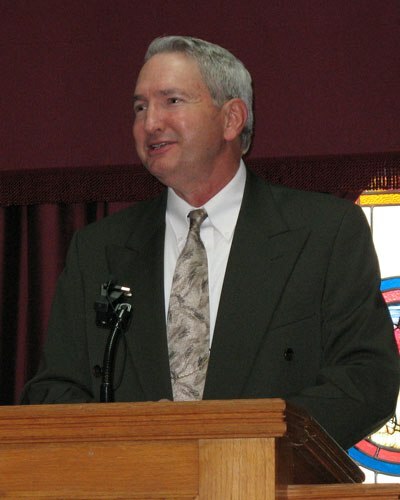 He has preached for congregations in Texas (Mansfield, Bailey, Clarksville, Wellington), including the Pearl Street church in Denton (which moved and became the Sherman Drive congregation in Denton). Currently, he preaches and serves as an elder in Sheffield, Texas, and also serves as Professor of Philosophy at Tennessee Bible College. Other places and schools where he has worked include Tennessee (Antioch and Northeast in Putnam County, Flynn’s Lick in Jackson County, Red Boiling Springs in Macon County); Alabama (associate work in Foley); Oklahoma (Putnam City just west of Oklahoma City). Mac taught in the Brown Trail Preacher Training School (Bedford, Texas) for seven years when his father, Roy Deaver, served as Director; Tennessee Bible College (Cookeville, Tennessee, on both the undergraduate and graduate level) for five years (serving on the faculty with Roy Deaver, Thomas Warren, Andrew Connally, and others); Southwest School of Bible Studies (Austin, Texas) for three years. He has been involved in numerous religious debates and written for several brotherhood publications. His manuscripts appear in various brotherhood lectureship books. He served as editor of Biblical Notes Quarterly before it migrated to its current online presence. His published debates include the Deaver-Till Debate (on alleged moral atrocities in the Bible, 1991), the Deaver-Fox Debate (on the indwelling of the Holy Spirit, 1994), the Deaver-Hicks Debate (on divorce and remarriage, 1995), the Deaver-Lockwood Debate (on the work of the Holy Spirit, 1998), the Deaver-Moffitt Debate (on the work of the Holy Spirit within the Christian, 2000). Numerous of his debates have not been published as books, including the Deaver-Harris Debate (on the essentiality of water baptism, 1986), the Deaver-Holt Debate (on church benevolence, 1987), the Deaver-Sharp Debate (on church benevolence, 1991), the Deaver-Padfield Debate (on church benevolence, 1994), the Deaver-Billingsly Debate (on marriage, divorce, remarriage, 1995), the Deaver-Asher Debate (on church cooperation, 1996), the Deaver-Hoffman Debate (on salvation by faith alone vs. the essentiality of water baptism, 2006), the Deaver-DeVries Debate (on faith only, 2008), the Deaver-Preston Debate (on the A.D. 70 theory, 2008), and the Deaver-Vick Debate (on baptism in the Holy Spirit, 2011). His other books include Faith and Knowledge: A Refutation of Agnosticism (1991), Philippians and Christian Ethics (1995), The Holy Spirit: Center of Controversy, Basis of Unity (2007), Except One Be Born From Above (2013), I Will Pour Forth of My Spirit: A Brief Commentary on Acts (2015), The Hopelessness of Humanism (2016), and study guides on Genesis and Joshua. Mac is married to the former June McElhanon, daughter of Marvin and Rachel McElhanon. Marvin McElhanon was one of the first elders of the Brown Trail church. Mac and June have three children and numerous grandchildren. Mac has raised horses for years and continues to do that. He is “most at home” in a country atmosphere and with good country people.